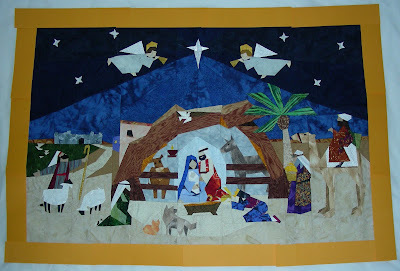 Did a bit more work on my Nativity. I added a tiny gold inner border and then a larger border of sand and sky. Next step it to pillowcase a back and the batting, do a bit of machine quilting and then on to the beads, sequins and bobbles! That will be the fun part. Hey, this guy might actually be done for THIS Christmas! Thanks for the deadlines, Cody Anne! A friend passed along this great tip for dealing with sewing machine needles! 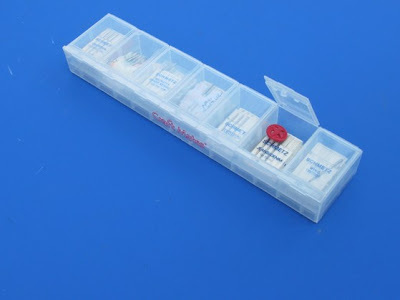 An inexpensive bead box (available at most craft stores) serves as the perfect solution for keeping your various needles segregated by size and function. When you change a needle, I put a little antique button into the compartment so you'll remember what's in the machine. What a wonderful tip! Putting all my needles in a bead box THIS VERY AFTERNOON!!! !